– The Banner printed him, so he must be worth reading! Born 1812 as a twin. Twin brother sadly died. Father also called James. Father died when he was 8. He was raised a Baptist. Key Question 1: Why do we have confessions of faith? Answer: To declare the beliefs of the church, to protect the church, to teach the church, to aid the church worship. Key Question 2: Can you acknowledge the truth of Christianity and be unsaved? 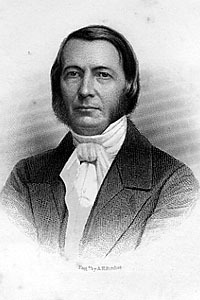 Palmer stated, “The gospel was nothing more than a sublime philosophy; and if it secured the homage of his intellect, it failed, as yet, to control the affections of his heart.” But in his final year at college Thornwell through reading the bible was convicted of his personal need of salvation and was saved. On his conversion, he professed faith in the Presbyterian church. Key Question 3: If even great preachers can be downcast over their preaching how do we encourage our pastors today? We now come to an interesting feature of Thornwell’s life. His continual moving from preacher to professor, to preacher to professor! Ordained 1834-37, Professor of Metaphysics South Carolina College 1837-39, Pastor in Columba 1839-40, Professor of Sacred Literature and the Evidences of Christianity South Carolina College and Pastor of College Church 1840-51, Pastor in Charleston 1851, President of South Carolina College, 1852-55, Professor of Theology Columbia Theological Seminary 1855-1862. Key Question 4: How do we determine our callings? Key Question 5: Have we ever used the Confession for devotional purposes? Now lets pause to discuss the key theological issues raised by Thornwell, and most of them relate to the church. Key Question 6: What should be the role of the church in public life? Answer: The spirituality of the church. Key Question 7: Has God given us a system of government for the church, or left it to our own wisdom? Key Question 8: What does it mean for a church to adopt a confession of faith? Thornwell died in 1862, while the American Civil War was raging. He was a southern man, and so supported the Southern cause wholeheartedly. He was the first moderator of the Southern Presbyterian Church and its chief theologian. This meant that he advocated slavery (although prior to the war he was moving towards the emancipation of slaves). Key Question 9: What can we say about Thornwell’s support of slavery? Michael Horton, The Christian Faith: A Systematic Theology for Pilgrims on the Way, 23. See also here and here. Mystery is not a bad word in theology!